A Sioux Warrior Captures Cavalry Mules. Image from The Half Moon Ledger. Sometime around 1865, prospector J.S. Moore purchased a small accounting ledger in which to keep track of his money. He was attempting to make his fortune near the Bozeman Trail, which connected the gold rush territory of Montana to the Oregon Trail. Unfortunately, the area was smack dab in the middle of the lands in dispute during Red Cloud's War (1866-1868), a series of battles fought by a combined force of Cheyenne, Arapaho, and Sioux against white men threatening bison herds near the Powder River. Moore became collateral damage in that fight. The prospector was killed, and his ledger fell into the hands of Lakota Sioux warriors. 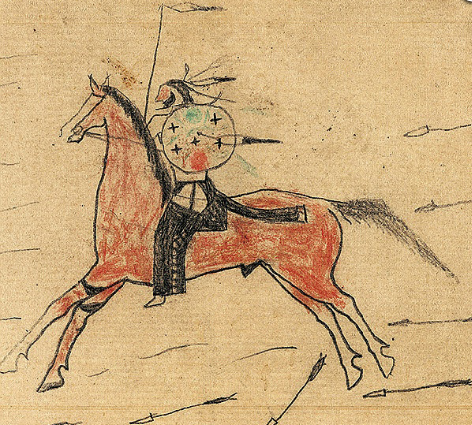 At the time of Red Cloud's War, the Plains Indians had just become familiar with the white man's tools for writing and drawing--graphite, colored pencils, ink, and, of course, paper. In Native American hands, Moore's accounting ledger began a second life as the pictorial battle record of a band of Lakota warriors. 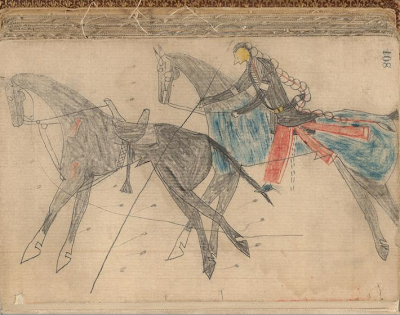 At least five unidentified Sioux braves created drawings depicting their feats of derring-do on its pages. In total, 77 drawings of their exploits were added to the ledger, before the violence between the Native Americans and the white men once again caused the small book, about the size of a mass market paperback, to change hands. Bearing A Shield Decorated With Celestial Symbols. As legend has it, in the aftermath of the Battle of Little Big Horn (1876), an Army private stumbled upon a funerary lodge in a deserted Lakota village. One of the dead lying in state there was said to be a great Sioux warrior, Half Moon. (In fact there is some doubt as to whether Half Moon ever existed; his name has never been found in any Sioux tribal records.) Next to his corpse, it was said, was a mail bag, atop which was the ledger. The soldier took the book as a souvenir, and it became known thereafter as The Half Moon Ledger. Sometime later, the soldier apparently learned the book was valuable, and placed it up for sale. The next recorded owner of the ledger was a Chicago newspaperman, James "Phocion" Howard. Howard was a shrewd businessman, who knew how to make a quick buck. Rather than reselling the book as he originally purchased it, he added such trappings as a leather binding tooled in gold, and a title page proclaiming it to be: The Pictorial Autobiography of Half Moon, an Uncpapa Sioux Chief. Who was killed in the Battle of the Rosebud, June 18, 1876, And who with Four other Chiefs was found lying in State on the Custer Battlefield June 28. Captured From The U.S. Cavalry. Howard's "improvements" were meant to make the ledger more attractive to buyers. Apparently, it worked, as this now curious amalgamation of two cultures was purchased for an unknown sum by a New York City rare book dealer. In the ensuing years, the volume made its way to Boston. Finally, in 1930, it was donated to Harvard University's Houghton Library by the sister of an alumnus, Harriet J. Bradbury. As is sometimes the case with volumes in large academic libraries, the ledger remained overlooked and essentially unexamined for nearly 80 years. Wearing A Coat Taken From A Cavalry Soldier. Early in the 21st century, Harvard librarians came to realize that The Half Moon Ledger was something special. 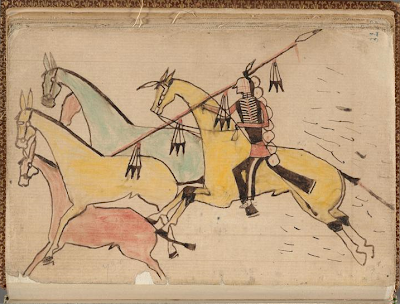 Ledger drawings by Native Americans are not uncommon, but to find a large number of them in their original context is extremely rare. The volume also proved of great interest to the University's Peabody Museum of Archeology and Ethnology, which houses one of the largest collections of indigenous artifacts in the Western Hemisphere. 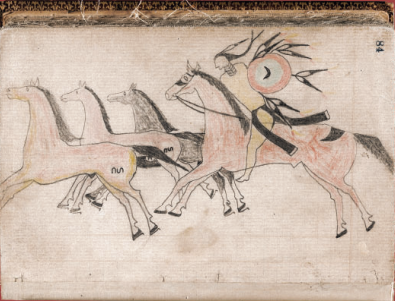 In concert with the Houghton librarians, curators at the Peabody and members of the Standing Rock Sioux tribe began to study the ledger's historical significance in depth. Peabody curator Castle McLaughlin already had a particular interest in one aspect of the ledger. She was the co-founder of the Nokota Horse Conservancy, a non-profit group dedicated to preserving blue roan horses, descendants of the breed revered and immortalized in the Sioux warrior's drawings. Researching the breed for three years at the behest of the National Park Service, McLaughlin connected today's surviving animals directly to their ancestors ridden by the Lakota Sioux Chiefs. 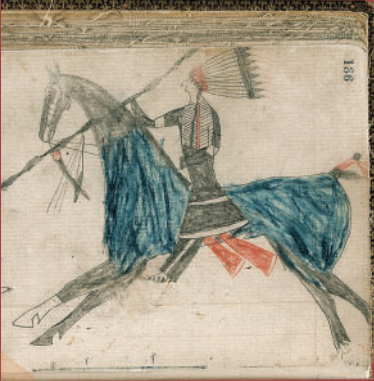 A Chief In His Battle Finery Astride A Blue Roan. Through her work with the horse conservancy, McLaughlin also formed a friendship with Lakota tribe member Butch Thunder Hawk, a respected contemporary artist, and tribal arts instructor at the United Tribes Technical College in North Dakota. Together McLaughlin and Thunder Hawk--along with Peabody exhibits director Sam Tager-- created an ongoing exhibit now on display at the museum, which is centered around The Half Moon Ledger. The multimedia exhibit is entitled "Wiyohpiyata": Lakota Images of the Contested West. The word "Wiyohpiyata" literally means "the direction West" in the Lakota language, but it "is both a celestial orientation and a concentration of natural and supernatural forces," according to curator McLaughlin. As the exhibit's brochure states, "In traditional Lakota belief, Wiyohpiyata... is one of four sacred directions that are associated with a color and animal spirits. Wiyohpiyata (black/blue) is home to the spirit of thunder and lightning, Wakinyan, the Winged-One or Thunder Bird. It controls the winds, the storms, and warfare. All things from the West are mysterious or holy." A Sioux Courageously "Counting Coup,"
Or Touching The Enemy With His Bow. Among many artifacts, contemporary art works, and audio and video installations on display for the exhibition, are a complete facsimile of The Half Moon Ledger, reproductions of selected pages, and the ledger itself. Due to extreme fragility and risk of damage from light exposure, the ledger is carefully opened to a single page, which is secured with a thin strip of archival-quality plastic. The page is turned every three months by Houghton Library Lake Conservator Mary Oey. Pages are only allowed to be on display--under glass--after they are monitored for color fading by a spectra photometer. The Half Moon Ledger will remain on exhibit at the Peabody Museum of Archaeology and Ethnology through early August of 2011, at which time it will be returned to the Houghton Library. But in keeping with its early history of passing from hand to hand, there's a chance that the volume will leave the Harvard library for good. The book’s reputed discovery at a grave site may make it subject to the Native American Graves Protection and Repatriation Act. 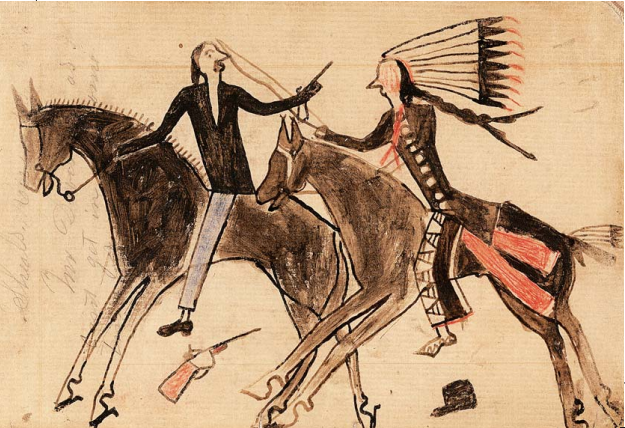 If Sioux and Harvard researchers conclude that the legend of its discovery in a funerary lodge is true, The Half Moon Ledger must be returned to the Lakota tribe.